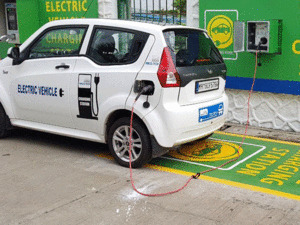 Using the “polluter pays” principle, the government has drafted a plan to impose a fee of Rs 12,000 on purchase of new petrol and diesel cars to raise money for incentivising electric vehicles (EVs) and battery manufacturing, under a new policy that is nearing finalisation. A note prepared by NITI Aayog after a meeting of top secretaries has proposed incentives of up to Rs 25,000-50,000 in the first year for those buying electric two-wheelers, three-wheelers and cars. To ensure that the gains aren’t pocketed by automakers, officials have proposed a direct benefit transfer to EV buyers while offering km-based incentives for state agencies operating e-buses. The revamped policy, which will require ministerial clearance, has been drafted after Prime Minister Narendra Modi junked an earlier draft and asked bureaucrats to ensure that batteries were incentivised to lower costs instead of offering sops to automakers. As the surcharge on “polluting cars” rises to Rs 70,000 in the fourth year, the government hopes to mop up over Rs 43,000 crore through the new levy. The surcharge burden will not be limited to fossil fuel cars. Petrol/diesel two-wheelers, three wheelers and commercial vehicles too will have attract a surcharge of Rs 500-25,000 in the first year, which will go up to Rs 4,500 to Rs 90,000 in the fourth year. The money will flow into a dedicated fund to be managed by the heavy industry department. The incentives for EVs will gradually come down from Rs 50,000 in the first year to Rs 15,000 by the fourth year of the policy. The levy comes with several incentives that are being proposed, ranging from lower customs duty and goods and services tax on raw material, components and battery packs, to waiver of registration fee and road tax for all EVs. A part of the surcharge is also planned to be used to encourage domestic battery production. Sources said an incentive of Rs 6,000 per kilowatt hour (KwH) will be offered. Further, the plan includes assistance for setting up charging infrastructure that may cover the entire cost. The government will spend about Rs 200 crore for developing indigenous technology in areas such as power electronics and battery development, said a source aware of the proposals. An official said the government think tank has also proposed that the government should mandate localisation with 40% Made-in-India parts for e-buses and e-cars, which will be increased to 60% from April 2022. To discourage import of completely built units, the government has decided to retain the current import duty that ranges from 25-100% across various segments of the auto industry.